Peter came to sailing through windsurfing, when a friend invited him on a sailboat trip. Hooked on sailing from then on, he has sailed and raced extensively. Peter has an earnest passion for sailing and has taught for over 15 years, enjoying sharing his love of the water and helping students develop their sailing skills. He has extensive sailing experience throughout Europe, Mediterranean and Africa, and has completed several oceanic deliveries and charters, as part of his cruising experiences. 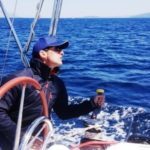 Peter is an DGRM Ocean Skipper for sail and motor, a fully qualified RYA/MCA Yachtmaster Offshore – commercially and STCW endorsement, a RYA Instructor for sail and a SRC Assessor. Peter has an engineering degree background and when not sailing, can be found windsurfing around Lisbon area beaches. He is always never too far from the water!